In the days after I quit my job, I tried figuring out what to do. Yes, I would go to Australia. I had my mind set on this train trip across the country. There is one from east to west (and vv) and one from north to south (and vv). I went through the last available tickets for the train and found one early September and one early October. It would require me to travel around a little. But I also wanted to try renting a motorhome. This is how the plan started taking shape: Fly to Perth, take the train to Sydney, get a motorhome and get to Darwin, take the train to Adelaide and fly home... Easy-peasy! Just staying in Perth the full week didn't seem too exciting. Researching on what else there was to do started right away. "You have to check out Monkey Mia", they said and I agreed. Feeding dolphins seemed like an amazing experience. But whatever I did, there weren't any tours available in that specific week. All I could find was a scenic flight from Kalbarri to Monkey Mia and back. Better than nothing, because driving there in a rental car instead would also cost a fortune (and might kill me with the jetlag and the long driving distance). And so it happened that "organised @r00sj3" planned only her first week in Australia beforehand. 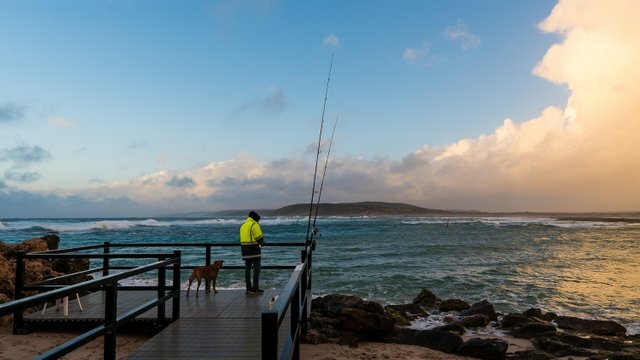 I would fly from Perth to Geraldton, would rent a car and drive to Kalbarri. I'd take a scenic flight to Monkey Mia to see some dolphins and the second day I would explore the Kalbarri park. And after that, I'd return to Geraldton and Perth. We were waiting for take-off. Through the window, I could see the clouds rolling in and the sky suddenly turned pretty dark. When I finally arrived in Perth, the clouds just seemed to have followed me. The first few days not much happened. Jetlag was laughing in my face. I struggled to make myself leave the hotel room. And before I knew it, my plane landed in Geraldton and I was driving to the north. 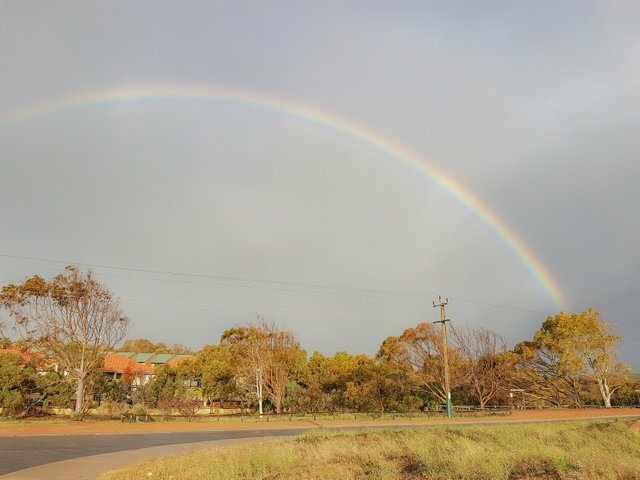 There were a few things on my list to see on my way to Kalbarri. 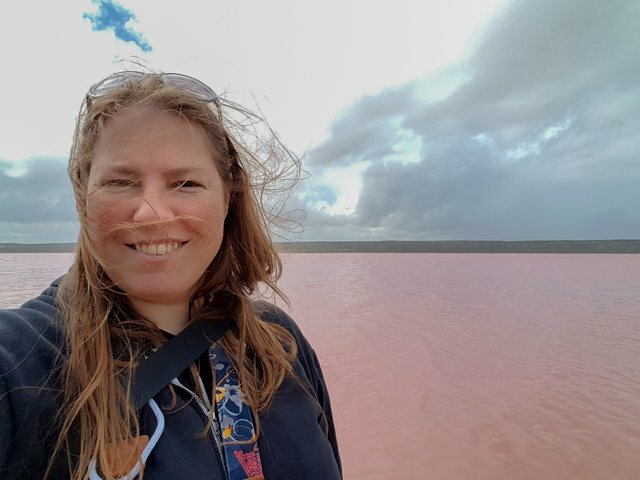 But the place I was most curious about was this weird pink lake (Hutt Lagoon) just halfway. When you arrive at this spot, you can already see the lake show up in the distance. I drove next to it and it looked a bit greyish beige red but it mostly looks just dirty. The weather didn't help though. The sun was hiding behind the clouds. At the car park, I got my camera and drone. But the water was still just dirty. When I stood on the banks of the lake, it just looked like a super polluted pond. I was disappointed that my photos would not be able to catch the pink colour that I had seen in "advertisements". And then it happened. The clouds made way for the sun. And instantly, the water became super pink! And if you're wondering why the water is pink? Hutt Lagoon is a salt lake that hosts a huge amount of algae. Those algae produce a pink/red pigment that floats around the water. And when the sun shines just right, it shows this amazing colour! I was in a bit of a hurry though. So I skipped the burger bar next to the lake and continued north. There was still so much to see and I wanted to arrive at the resort in Kalbarri before dark. It was my first time driving in Australia and all I heard was these horror stories of crashing your car into kangaroos at night like they are aiming for your lights on purpose. There were still a few hours left before dark. I followed the road north and saw dead kangaroos left and right. The roads were rather empty so it really felt that these animals just waited for a car to show to commit suicide. I got close to Kalbarri and saw the first viewing point sign. 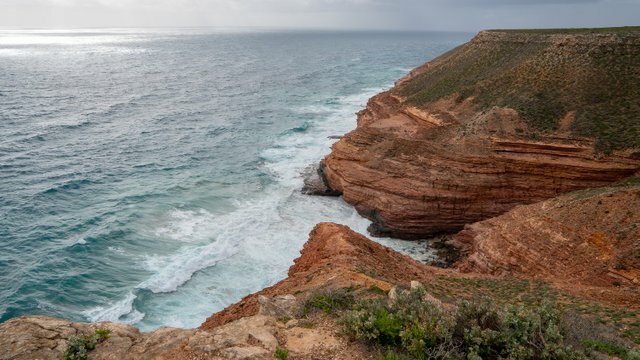 By now I had arrived at the Kalbarri Coastal Cliffs. And while it was foggy and the sky looked like it could start raining any minute, I didn't not want to stop. Viewing point...after viewing point...after viewing point. I started seeing a pattern which I really liked. These Australians had the habit of naming things after their looks. And so I saw Island rock and Natural Bridge and will forever remember what name will go with what photo. 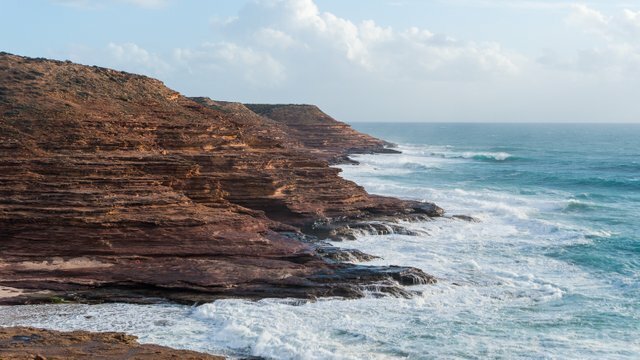 But without the specific rocks, the Kalbarri Coastal Cliffs just look spectacular anywhere! I decided to skip the last few viewpoints to get to the resort in time. Plenty of time in Kalbarri to check out the rest, I thought. That night, all hell broke loose. It started raining while I was waiting for my pizza and it never stopped. The next morning, it was still the same. It took a long time to even get the slightest bit dark outside. This scenic flight to Monkey Mia was not going to happen, that was for sure. But what else was there to see or do? The short answer: nothing... Due to the weather and lack of tourists, none of the tours would go. I was stuck in my resort and all I could do is watch some Netflix and wait for the storm to stop. It took until late that afternoon when it finally stopped raining. Just enough time to visit the viewing points of the coastal cliffs that I hadn't seen yet. I got to Mushroom Rock by climbing down some way too slippery cliff path and decided I wasn't going to risk that again. Lucky for me, most of the car parks are very well situated near viewing points. But still not close enough to avoid a few showers, though. 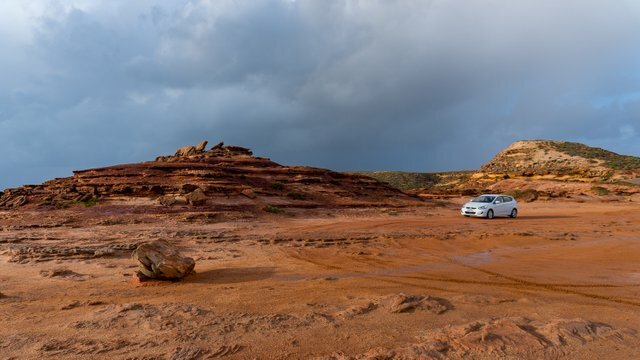 The next day I would fly back to Perth and so far, this whole Kalbarri experience wasn't what I expected. I crossed my fingers. I would go to Kalbarri National Park before heading to the airport. 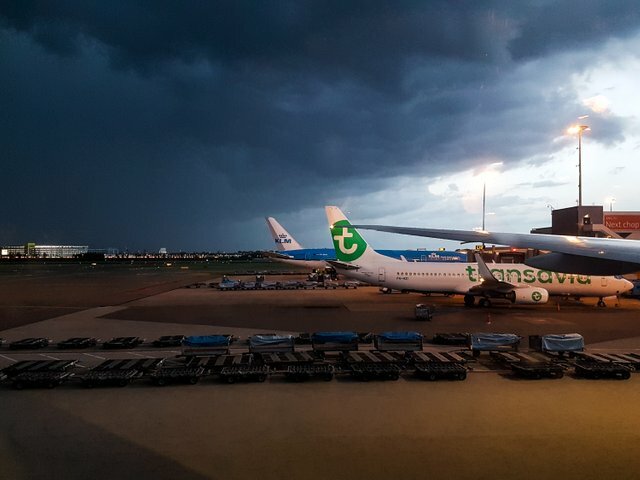 Hopefully, the storm was now over! i had no idea about the naming stuff until i seen your post about bridge or mushroom and it kinda makes sense. I thought it was a bit of a coincidence. But later during the trip the Australians themselves started making fun about their habit of having super obvious names for everything! 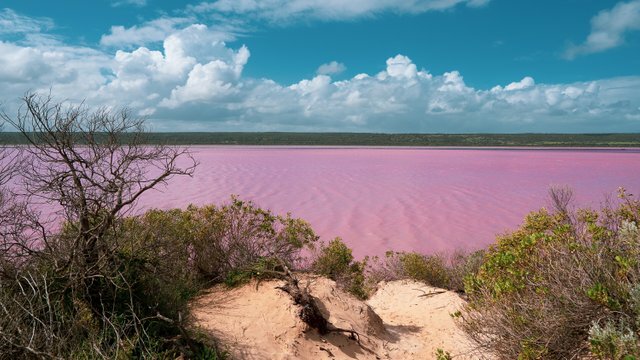 Wow, I never knew about that pink lake. I've only made it to WA once though, and that was Perth. That's too bad. Because the west coast is kinda amazing! You're missing out!! Congratulations! Your post has been selected as a daily Steemit truffle! It is listed on rank 11 of all contributions awarded today. You can find the TOP DAILY TRUFFLE PICKS HERE. I upvoted your contribution because to my mind your post is at least 8 SBD worth and should receive 207 votes. It's now up to the lovely Steemit community to make this come true. Hiya, just swinging by to let you know you're being featured in our daily Travel Digest. Please drop by to check out all the rest of today's great posts and consider upvoting the Travel Digest if you like what we're doing. Loved hearing about your adventures in the wild west @r00sj3. I hope you were able to go to the Kalbarri National Park. Such an amazing area. I wasn't aware of the Hutt Lagoon when I travelled north of Perth or I would have gone there too. Must have felt like you were on another planet.